High risk (70% ) – Families or single moms who earn below $100,000 per year and a $1 more than government support thresholds (see highlighted chart below) for programs that assist with housing, food, child care, medical insurance etc. Is your child, or a child you know, going through a critical medical crisis? Contact Us. Families should not have to lose their job, health, home or enter into bankruptcy to care for their critically-ill or injured child during a medical crisis because they do not qualify for government aid. 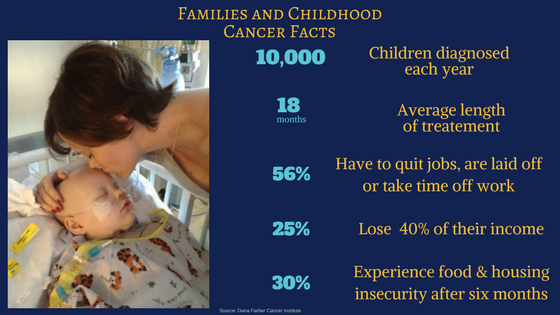 When a family receives the news of their child’s cancer diagnosis or other life-threatening illness, they instantly become overwhelmed by the diagnosis. Families often think they can navigate this on their own with friends or family to help. What they don’t realize is this is a long journey and those same friends and family members, with the best intentions, often go back to their lives when support is needed most. Here to Serve’s priority is to continually engage the family support network throughout the entire journey, providing resources and opportunities for friends and loved ones to address the family’s needs with the least amount of intrusion. There are not recognized support systems in place for families whose household incomes disqualify them from government aid. Help is required to address not only the needs of children in medical crisis, but their families and caregivers. Parents suffer from increased stress and make substantial financial sacrifices during the length of their child’s treatment. Half reported that their own health had deteriorated since becoming caregivers. In a study of 500 caregivers conducted by Family Caregiver Alliance, 90% found caregiving to be frustrating, draining, and painful.